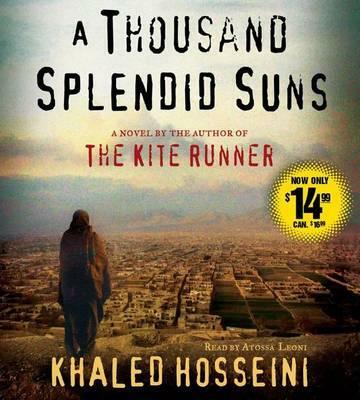 AFTER MORE THAN TWO YEARS ON THE BESTSELLER LISTS, KHALED HOSSEINI RETURNS WITH A BEAUTIFUL, RIVETING, AND HAUNTING NOVEL OF ENORMOUS CONTEMPORARY RELEVANCE. A Thousand Splendid Suns is a breathtaking story set against the volatile events of Afghanistan's last thirty years -- from the Soviet invasion to the reign of the Taliban to post-Taliban rebuilding -- that puts the violence, fear, hope and faith of this country in intimate, human terms. It is a tale of two generations of characters brought jarringly together by the tragic sweep of war, where personal lives -- the struggle to survive, raise a family, find happiness -- are inextricable from the history playing out around them. Propelled by the same storytelling instinct that made The Kite Runner a beloved classic, A Thousand Splendid Suns is at once a remarkable chronicle of three decades of Afghan history and a deeply moving account of family and friendship. It is a striking, heart-wrenching novel of an unforgiving time, an unlikely friendship, and an indestructible love -- a stunning accomplishment. Khaled Hosseini was born in Kabul, Afghanistan, and moved to the United States in 1980. His first novel, The Kite Runner, was an international bestseller, published in forty countries. In 2006 he was named a U.S. envoy to UNHCR, The United Nations Refugee Agency. He lives in northern California. Atossa Leoni has been working internationally in film, television and theater since childhood. Of Afghan and Iranian descent, she was born and raised in Europe and has been living in California for the past decade. Atossa played the female lead "Soraya" in Marc Forster's film "The Kite Runner" based on Khaled Hosseini's best-selling novel.